Ace Austin and Madman Fulton are making a name for themselves! Announcer Josh Mathews mentioned while calling this week's edition of Impact Wrestling how the roster is consistently getting younger. One of the trailblazers making a name for himself in the X Division right now is one Ace Austin, who was part of one of the most breathtaking moments from WrestleMania 35 weekend. Austin was the special guest during this week's edition of the Press Pass Podcast, moderated by longtime employee, Ross Forman. Also part of the podcast was Madman Fulton, whom you may know as Sawyer Fulton from NXT. 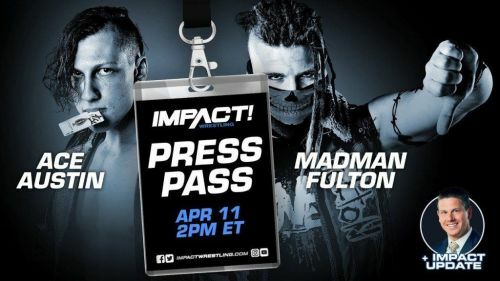 Fulton has been making a name for himself as a part of the heel stable oVe, and is the muscle of the group carrying out Sami Callihan's twisted and sadistic plans. I had a chance to interact with both of these gentlemen during the course of the media round. Here's a glimpse of our conversation. Madman, for a man with two degrees (biology and environmental science), what drew you to pro wrestling? Fulton: Pro Wrestling has literally been the only thing I've had a dream of doing my entire life. To be fair, I don't remember the first match that I watched. It's always been something that has driven me. It's always been a goal. So, I got my start in amateur wrestling because of professional wrestling, because I thought that when you show up, there would be a ring. When there was only a mat, I thought maybe the ring came later. It took me sixteen years of amateur wrestling to get there but that's what drove me to college. Honestly, I don't know if I'd have pursued more education in my life had it not been for my love of professional wrestling. It ended up letting me become a two-time All-American in amateur wrestling. I got two degrees, one in biology and one in environmental science because one day when this whole wild ride is over I'll finally be able to retire and use my biology and environmental science degrees to only be around animals and never have to talk to another human being again. That's the plan anyway. Ace, what did you think of the incredible social media reaction to your crazy spot from 'United We Stand'? Austin: I don't think it's gotten enough buzz if you ask me. I think that there's room for a lot more people to talk about how wild I am. Catch Impact Wrestling every week only on SONY ESPN & SONY ESPN HD.